The oval basket form developed around 1700. The goldsmiths of the time used a combination of piercing and chasing to simulate basketwork. The base of the basket was usually engraved with a coat-of-arms, which was later surrounded by chased scrolls and foliage. Often the openwork sides were embellished with rosettes. A pair of covered boxes commissioned from Gabriel Sleath in 1717 by the Keeper of Phoenix Park, Sir Alexander Cairns Bt. 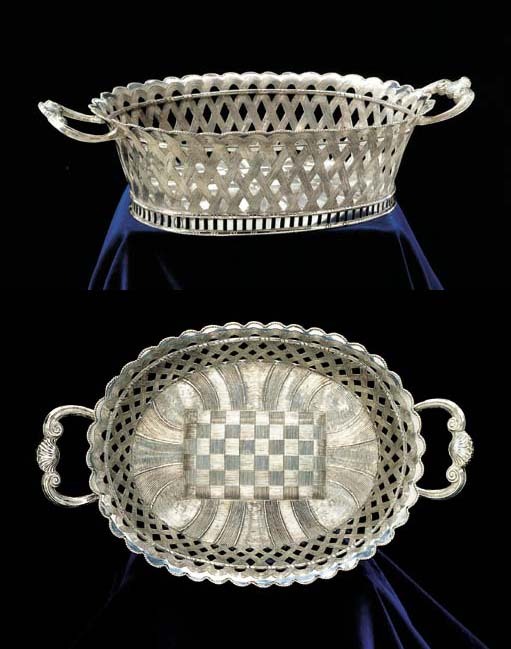 (d.1732), (Christie's London, 3 May 1995, lot 90) show a differing basketweave technique. The sides and cover are unpierced and chasing alone conveys the illusion of woven reeds or rushes, suggesting the pieces were picnic boxes or paniers. Wickes uses such a technique to embellish the centre of this basket. Whether the family who commissioned the basket did not bear arms or whether Wickes did not wish to mar the illusion, we shall never know. The result is a masterful display of the chaser art, with even the hallmarks distributed about the angles to lessen their impact on the illusion. Later in 1734 Aymé Videau makes use of the same technique but perhaps at the insistance of the patron, lessens the effect by engraving a coat-of-arms on a plain oval cartouche in the centre of the basket (see V. Brett, The Sotheby's Directory of Silver 1600-1940, London, 1986, p. 204, fig. 877).